After reading the above excerpt in Genesis, I began to wonder why Eve was speaking to the serpent at all. After all, the serpent was her enemy. The answer is perhaps because Eve didn’t recognize her enemy. She simply didn’t know he was her enemy. Additionally, we know that the original sin is called the “Sin of Adam,” even though Eve ate the fruit from the tree first. This is because when God told Adam not to eat of the tree, Eve wasn’t created yet. This information was given to Eve by Adam, not by God. Adam’s relationship with God was deeper and longer. He was her Guardian. What she did know was that Adam told her that God had commanded them not to eat the fruit from the tree. And that listening to the serpent was gravely wrong because it meant she trusted the serpent over God. But she listened to the serpent anyway. At this point in time she didn’t have any idea of what evil was. She had never seen it. The serpent to her was just another of God’s creatures. And in this moment in the Garden, he, like God, like Adam and Eve, they are ALL in the Garden together. Adam is the head of the human family so the sin is attributed to him, though it came through her first. It should have been enough for her to know not to disobey God at the word of her husband. The account also says the serpent was the MOST cunning of all of the animals. This means he was really convincing to her. A creature God created, who was cunning and wise, convinced her. And as for Adam, his desire for Eve seemed to outweigh his desire to obey God. He was the one who heard from God not to eat from that tree. Yet, he was there when she did, and he made a decision to go along with her. He must have desired her more than God. Both of them had the sin of disobedience. Her desire was to be like a god because she was convinced by the serpent. Adam’s desire to be with Eve more than God. The disobedience was grave and led them to experience evil for the first time. The punishment gets inflicted AFTER the choice is made to disobey, and the worst punishment goes to the Serpent, which makes sense, HE KNEW exactly what he was doing. His free will choice was to disobey, not serve and steal dominion from them. We recognize the serpent in this story as being Lucifer, who was once the highest angel. He was created by God, though he did not have the beatific vision. St. Thomas Aquinas and Mary of Agreda tell us he was shown the incarnation coming through Mary. He didn’t want the hypostatic union to come through her, but through him and so he cultivated the disordered desires of envy and pride that were allowed because of his own free will, and acted on them. He probably wanted to show God how stupid the humans were and how weak and easily convinced they could be to give up their dominion, their authority, to him the serpent. He probably thought, then God would stop loving them, realize how weak they were, and not ask a human woman to carry the incarnation. He thought he was better and he was envious. Lucifer didn’t want to serve the humans as God asked. He was the first to give into disordered desire. And he knew better. But the serpent, Lucifer, was wrong. God didn’t stop loving us. Because even though Adam and Eve disobeyed and were punished for it, God was still right there in the midst of them. He even called out for them to return to Him when they ran and hid in their nakedness. Then we see God clothe Adam and Eve better than they could clothe themselves, and we know too, he provides a way back to full union with him, making covenants, that culminate with the sending of His Son. Even though we created a rift, God didn’t leave or abandoned mankind. This is a God who loves us. God, who is wholly perfect, doesn’t really need anything from us, but he knows our obedience to him is good FOR US. He is constantly asking us to obey, not because he is an egoist who needs it from us, but precisely because when we obey, we flourish with life and our experience is of joy, not of evil and death. Their disobedience was grave and brought death into the world. Obedience is also an act of self-sacrificial love. When we obey God, we are in essence placing our full trust in Him, believing that He knows what is best for us. We are also setting our own agenda and plans aside, sacrificing our own will in order to do God’s will. The obedience that God calls us to is always open to our own free choice and always a call to imitate Christ by demonstrating self-sacrificial love. The serpent is given enmity between us and him as a punishment. The one who received hatred was not us, but him. Instead of God dismissing us like Lucifer would have hoped, God exacted upon Lucifer what Lucifer had wanted for mankind. (Genesis 3:15) Enmity is hatred. It is an active hatred. So in order for us to gain back our authority from the devil, we must actively hate sin. We must repent and confess when we do it, and hopefully feel revilement when we see it. It is a “holy hatred” that we are to experience. A holy hatred of all that is sinful, all that is cultivated and now embodied in the spirit of Lucifer. The incarnation came through a human woman. Mary’s original sin was withheld, before her conception by God, she was in the exact same position as Eve was before the temptation. But there was one difference, Eve had no experience of original sin when she was tempted. The serpent was cunning and convinced her to give up her domain, her authority, and disobey God. Eve didn’t know evil or sin. She hadn’t experienced the consequence of sin, neither her own sin nor the sin of others. This is precisely why Mary’s FIAT is so amazing. Mary and Eve had the same choice, obey God or not, but unlike Eve, Mary obeyed God despite the known consequences. For it was even under threat of death by stoning that Mary chose to obey. Eve on the other hand would have known nothing of death because it didn’t yet exist. It should have been easier for Eve to trust God, and this is why what she did was so gravely wrong. She let desire overcome trust when she had no reason not to trust. Mary on the other hand, seeing the effects of sin, could have not trusted, but she trusted unequivocally. 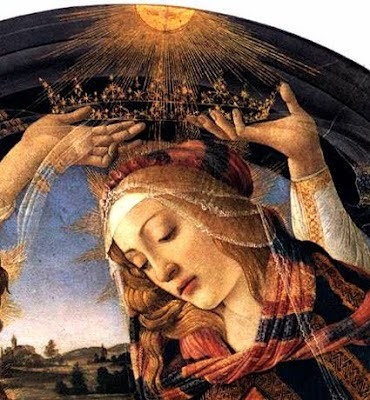 Mary truly is the Queen of heaven and earth. Her obedience shows us what true womanhood is. It is precisely through Mary’s surrender to God and her profound humility that we see how fierce and courageous she is. Mary placed all of her trust in God. She desired to only do God’s will, sacrificing her own will over and over again. She lived on this earth in continual preparation and hope for her eternal destiny. Mary set all pride, vainglory and sensual desires aside in order to fulfill our Heavenly Father’s mission. She was secure in her identity as a beloved daughter of a good Father and lived that identity to the fullest. Mary is the archetype of true womanhood. As the sinless woman, Mary understands exactly where all authority comes from, and thus she remains the Queen of her Dominion. Because of her perfect obedience to the Father, she now holds the highest place in heaven, something that had once been Lucifer’s. No wonder he hates her. In our culture today, we are being force fed a very different image of what it means to be a woman. Not only are the lines being blurred between manhood and womanhood, but women and girls alike, are being sold a lie. Our society tells women to act like Eve, give into your disordered desire and you will have the power of a god in this world. For women and men are the same and should thus act, look and have the same duties and purpose in life. Not only does our anatomy tell us otherwise, but our innate strengths and weaknesses also clue us into this fact. Unfortunately in our human nature, we are prone to compare each other based upon the standards of this world instead of based upon our eternal destiny. But we can make a different choice. Through the grace of the Sacraments we can hand ourselves to God. We can trust God. Jesus came to give us this grace. And we can look at Mary, and ask for the grace to be like her, and we can flourish. When desire gives way to obedience to God, life becomes a joy and a flourishing unlike anything you have ever seen. This entry was posted in Catholic, Uncategorized and tagged Adam and Eve, Blessed mother, Faith, free will, love, Mary, Obedience, Original Sin, Peace, Queen of Heaven and Earth. Bookmark the permalink. I thought ALL angels have the Beatific Vision. Can you tell me where this is explained that lucifer did not have it? Thanks. Saint Thomas at Summa theologiae I, qq. 63-64. Fran, just curious, what do you mean, “investigation” into my writings? I didn’t really know what you were speaking about.